Jim Caple: Is This Finally the Cubs' year? Tinker to Evers to Chance. The Homer in the Gloamin'. Let's play two. Three Finger, Gabby, Swish, Leo the Lip, Slammin' Sammy. As the Cubs embark on their 100th season without having attained a World Series title, their fans are full of optimism. The team made the playoffs last season. Maybe, just maybe, 2008 won't turn out like the past 99 seasons, when something went wrong ... every single year. Wait, what happened? In a game against the Cubs, Pittsburgh's Honus Wagner steals his way around the bases. Wagner repeats the feat the next day. The club falls out of first place on May 30 after getting swept in a doubleheader by the Pirates. Despite going 81-34 the rest of the way, the Cubs finish with 104 wins, six fewer than the Pirates and the highest winning percentage ever for a team that didn't finish in first place. Third baseman Harry Steinfeldt also is left unable to cash in on licensing the term "three-peat." Whoa! He played here? Heinie Zimmerman hits .284 in 99 games, but the best part is that his name is "Heinie." After coasting to the NL pennant, according to Glenn Stout's "The Cubs: The Complete Story of Chicago Cubs Baseball," all this happens before and during the World Series against the Philadelphia A's: Second baseman Johnny Evers breaks his leg on Oct. 1; Frank Chance questionably chooses Orval Overall, his third-best starter, for the opener (the Cubs lose); Mordecai "Three Finger" Brown gets into a car accident before the second game (and loses 9-3); Chance brawls with a pedestrian on the off day before Game 3. The A's win in five games. Whoa! He played here? In his second stint with the Cubs, Peaches Graham hits .239 in 36 games. The Cubs trail the Giants by just one game on Sept. 8 before the Giants pull away with a 22-8 finish. But what really does the Cubs in is a depleted talent base: Overall retires after the 1910 World Series, Steinfeldt complains about his contract and gets traded to the Reds, Evers suffers a nervous breakdown in May, and player-manager Chance sees his playing career end with what doctors diagnose as a blood clot in his brain. (He had been struggling with headaches and double vision.) But the worst comes in the offseason: Third baseman Jim Doyle, who had replaced Steinfeldt, dies after appendicitis surgery. Mordecai "Three Finger" Brown lost parts of two fingers in a farm accident as a kid, but he won 20 games six straight seasons for the Cubs. Wait, what happened? Our man Heinie nearly wins the Triple Crown, leading the NL in home runs (14) and batting average (.372), but missing the RBI title by three. Wait, what happened? 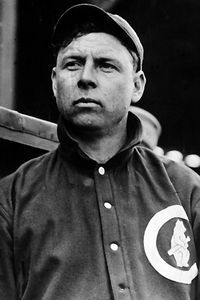 On Aug. 18, Phillies pitcher Erskine Mayer sets a National League record by giving up nine consecutive ninth-inning hits to the Cubs en route to a 10-4 loss. The Cubs are in first place at the end of April but never recover from an 8-16 May. First baseman Vic Saier and third baseman Heinie Zimmerman lead the top-scoring offense in the league, but the team can't win on the road: They go 51-25 at home, but just 37-40 on the road. The end of an era arrives on Feb. 11, when Evers is traded to the Boston Braves. That's the gentle spin on the situation. Owner Charles Murphy wanted to get rid of Evers as manager and essentially tried to "fire" Evers from the managing portion of his contract, which leads to a complicated situation in which the other NL owners arrange for Evers to be traded to the Braves and Murphy is forced to sell the Cubs. Meanwhile, the Cubs have their worst finish since 1902, and Evers helps the "Miracle Braves" win the World Series. Wait, what happened? On Aug. 18, Wilbur Good becomes the only Cub ever to steal second, third, and home in the same inning. Tied for first on July 17 with a 43-36 record, the Cubs then lose eight games in a row -- seven by one run. The season is over and the Cubs finish with their first losing record since '02. A fine front office at work: Joe Tinker has the honor of being the fourth manager in four years. He will be replaced after the season with Fred Mitchell. There isn't much good about the 1916 Cubs (especially the shortstops, who combine for 89 errors), but a momentous event does occur on April 20, when the team plays its first game at Wrigley Field (then called Weeghman Park, and later Cubs Park). It wasn't a new ballpark; Charles Weeghman, owner of the Federal League Chicago Whales, had built it for the Whales in 1914. After the Federal League was bought out after the 1915 season, Weeghman was allowed to purchase the Cubs (for $500,000). Believe it or not, the Cubs actually win the first game, 7-6 over the Reds. Wait, what happened? The crosstown rival White Sox bring the World Series trophy to Chicago. It wouldn't come back until 2005. You know it's not your year when nine-plus innings of no-hit ball isn't good enough. Chicago's Jim "Hippo" Vaughn hurls 9 1/3 no-hit innings, but Reds pitcher Fred Toney counters with 10 hitless innings. The Reds beat the Cubs 1-0 in the only game in major league history in which both teams go hitless through nine. Ex-Cub Factor: Former second baseman Dave Shean wins a ring with the Red Sox. The Curse of the Bambino? In a season cut a month short because of the Great War, the Cubs meet the Red Sox in the World Series. Ruth beats Vaughn 1-0 in Game 1 and then wins Game 4, 3-2. Maybe the Cubs never should have played their home games at Comiskey Park (they played there because Comiskey was larger). Ex-Cub Factor? Former catcher Pat Moran manages the Reds to the World Series title. The Cubs finish last in the National League in runs scored. Maybe giving Dode Paskert and his .196 average 270 at-bats isn't such a good idea. Research and text by Brett Edgerton, Mark Simon and Jeremy Lundblad of the ESPN Research Department. Additional contributions from Page 2 editors David Schoenfield and Michael Philbrick.